In early 2016, ELAN received funding from the Department of Canadian Heritage to explore how to support artists in engaging with English schools to benefit students and connect with community members. The initiative’s DESIGN! 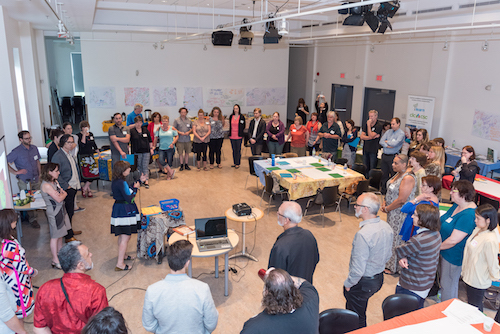 phase began with a full day of strategic thinking on how to develop ACE connections, pulling together a diverse group of people from the Arts, Community, and Education sectors. Fifty ACEJam! participants brainstormed overall networking, communications and capacity building strategies needed for projects to succeed in the TEST! phase. ACEJam! participants also generated TEST! Project ideas that were shared with potential applicants to develop projects involving artists, teachers, students and community members. Communities selected for funding were encouraged to develop capacity and sustainability by finding local partners and additional funding. The Five ACE TEST! Projects explored themes of identity, community, culture, and belonging, with several including development of intergenerational and/or intercultural relationships through diverse arts disciplines. Learning exchanges were facilitated amongst project coordinators virtually during project implementation and in person at the TEST! phase finale event, ACElebrate!, in the fall of 2017. Representatives of all ACE sectors were involved in advisory roles throughout the TEST! phase and continue to contribute to the planning and implementation of the SCALE! phase. Artist Laura Teasdale’s intergenerational project engaged three elementary schools in partnerships with nearby seniors’ residences. Local artists were selected to facilitate weekly learning experiences based on their ability to create a space for youth and the young at heart to connect, including singing, dancing, pottery and painting activities. 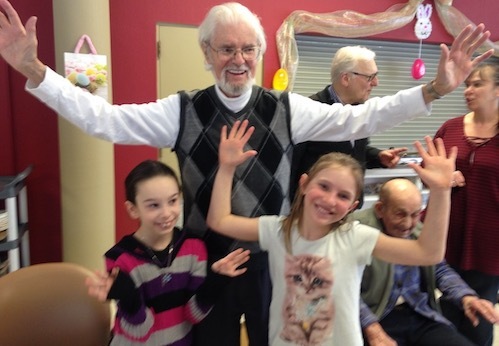 The project’s success at all three sites and their intention to continue confirms that the processes Laura developed to connect students and seniors through arts experiences can work in diverse contexts. Project Coordinators from the Lower North Shore communities of Chevery and Harrington Harbour, Community Development Agents Ana Osborne and Helen Morency were eager to move beyond the ‘fast food’ artist-led workshop experiences that are typical in remote communities. 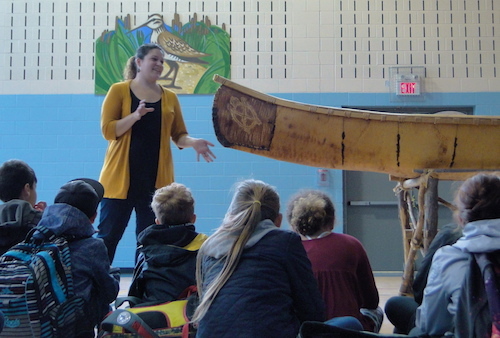 Riverside School Board Principals François Couture and Bob Matthey were inspired to bring the cycle two elementary social studies curriculum on Indigenous people to life through an artistic and cultural exchange – the Maison amérindienne helped them to connect with educators from the Kahnawake First Nations community. Artists facilitated preparatory visual and acoustic learning activities exploring identify with students, culminating in a fun-filled day of learning through arts, culture and recreation, hosted at Kateri Elementary School thanks to Principal Shelley Goodleaf’s shared desire to help students and adults see that “kids are kids”. With additional support from the Ministry of Education, the project provided teachers and students with an to opportunity discover each other’s truth and move towards reconciliation. In the ACE Initiative’s best example of the power of artist-teacher collaboration to engage students in learning through the arts, Student Artists from St. Lambert Elementary were facilitated by Teacher Christina Croce and Artist Susan Fuda in their Artist in Residence project, “Tell Me Who You Are” to explore students’ past, present and future. 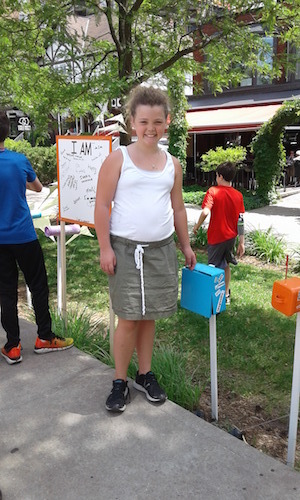 Students contributed to the design of writing, multidisciplinary art, and community art installation activities that Christina integrated as learning and assessment experiences. Their project reinforced ArtsSmarts’ findings on the impact that artists can have in co-creating meaningful learning situations for students of all abilities. Additional funds for the project were provided by ALDI/ASSET’s Innovation grant and St. Lambert Elementary’s Student Activity Fund. 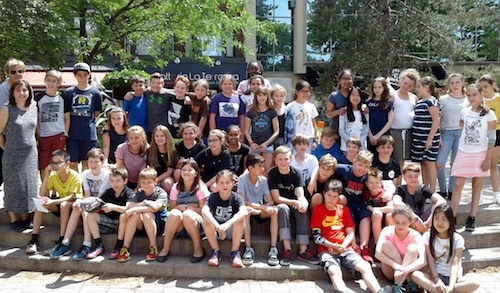 Based on her philosophy, “Art feels good,” Artist Deirdre Potash facilitated her “Garden in the Sky Community Project” at two Lester B Pearson elementary schools. 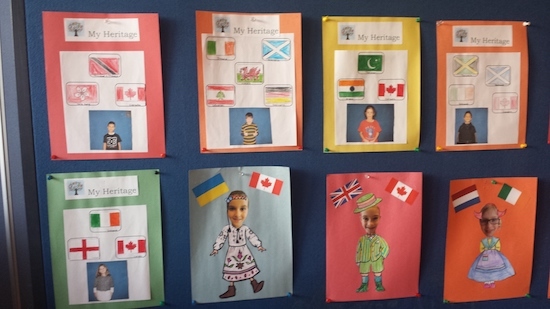 Thanks to the openness of the schools’ principal, arts educator and teachers, students participated in a writing activity and visual arts workshops exploring the diversity and richness of Canadians. Deirdre successfully applied for additional support from the Association of English Teachers of Quebec’s GET grant and the Government of Canada’s 150 celebration. 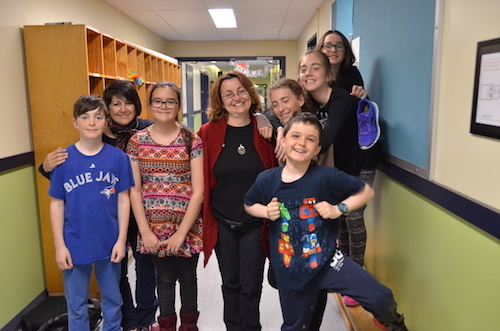 Students’ artwork was displayed and celebrated at Pierre Elliott Trudeau Elementary School’s multicultural festival – Deirdre was able to engage arts and cultural workers from diverse disciplines to animate activities at the heart-warming family/community event. seeking funding to facilitate school communities who are inspired to develop sustained ACE connections and AiR strategies to meet student and community needs. in the ACE Initiative’s development to date.